or: how I've decided to move all the switches into my tablet. 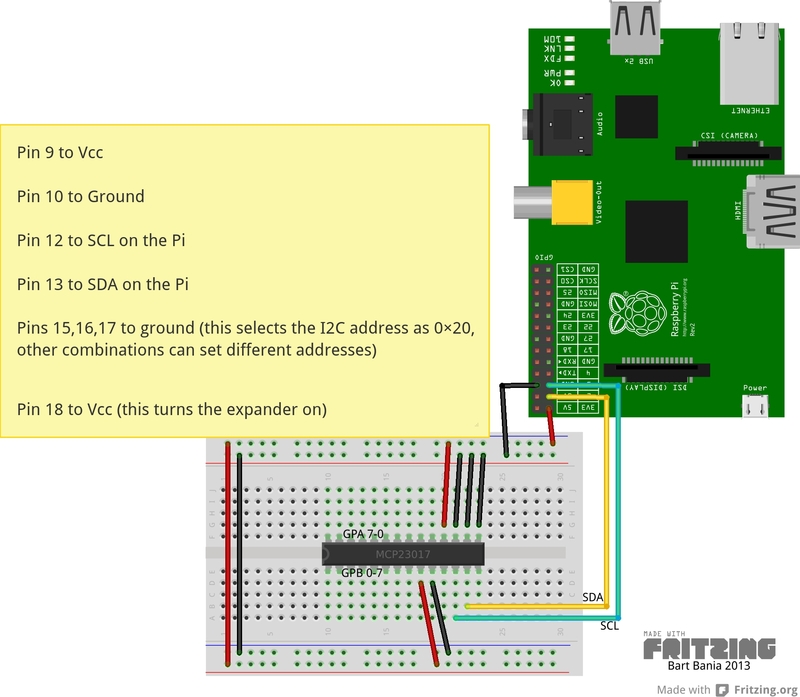 I've been exploring the possibilities of creating a home automation system using Raspberry Pi. It seems a great experience to do something like that on your own, not just buy special equipment (which is rather expensive). Since I've got now three R-Pis, I've decided to commit another one for a bigger project. One is already used as a web, NAS and print server, and I didn't want to risk any disruptions on the machine caused by other equipment. 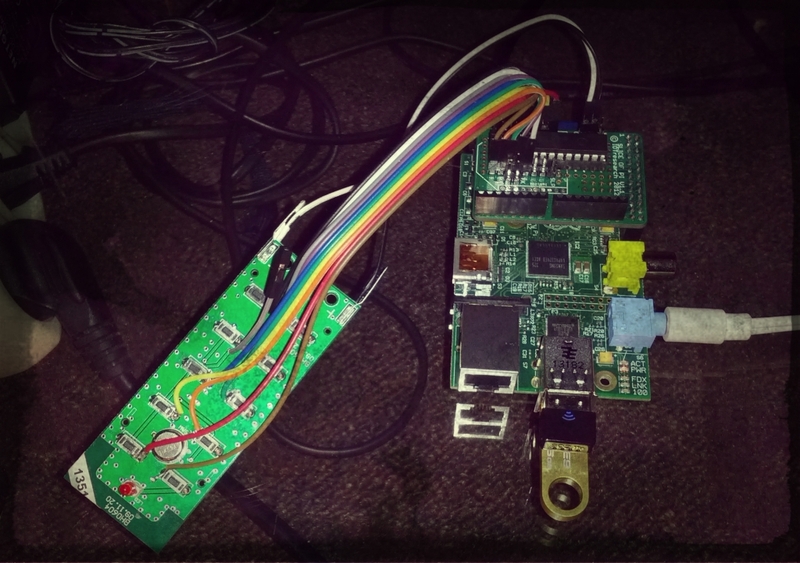 My another Pi, with project alias SecurityPi, will be performing several tasks. I've already created the Google Calendar API alarm clock for a non-convenient way of getting me out of bed (and, by chance, found a great command-line music player called cmus), so why not take it to another level and automate a bit my household? I've started implementing PiFace Digital into my project, making it respond to door/windows state, yet, it's not a perfect solution. Then I've come across an interesting automation project - heimcontrol.js. Bad luck. For now, I'm putting heimcontrol.js on the side. Just about when I was starting to lose hope, I've found a solution, not a perfect one, but doable. Tony from OddWires used with his project the same outlets, yet, he just decided to do it with wires. Fair enough, I've decided to do something similar. 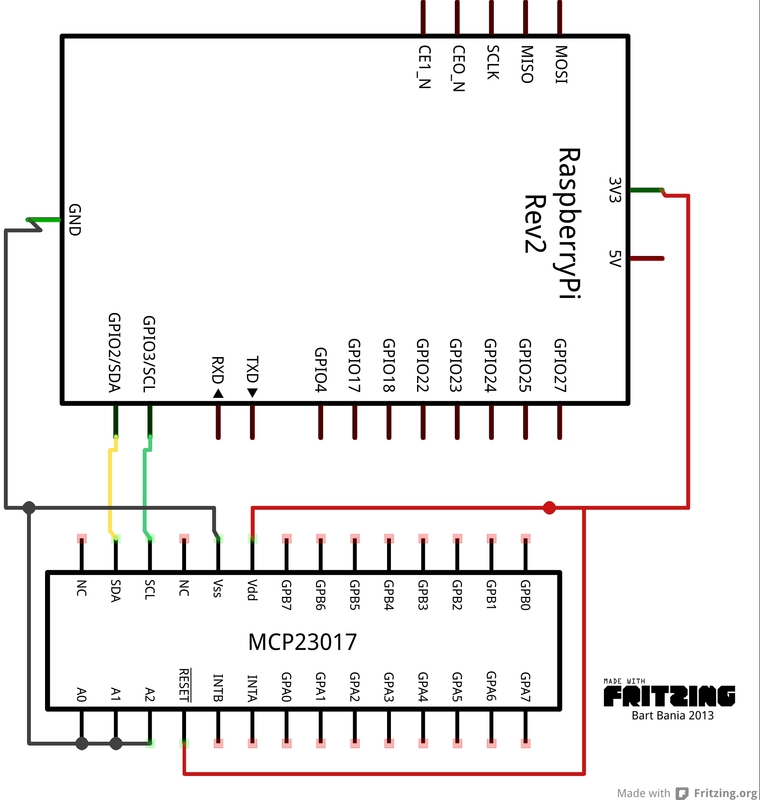 But, wait"¦ There are 10 pins on the remote, and only 8 GPIO ports on the Raspberry, and I still will be needing some of them for other things"¦ Then I've realised I could use the MCP23017 chip to low-costly expand my GPIO with 16 additional ports! With no time to lose, I've started breadboarding. 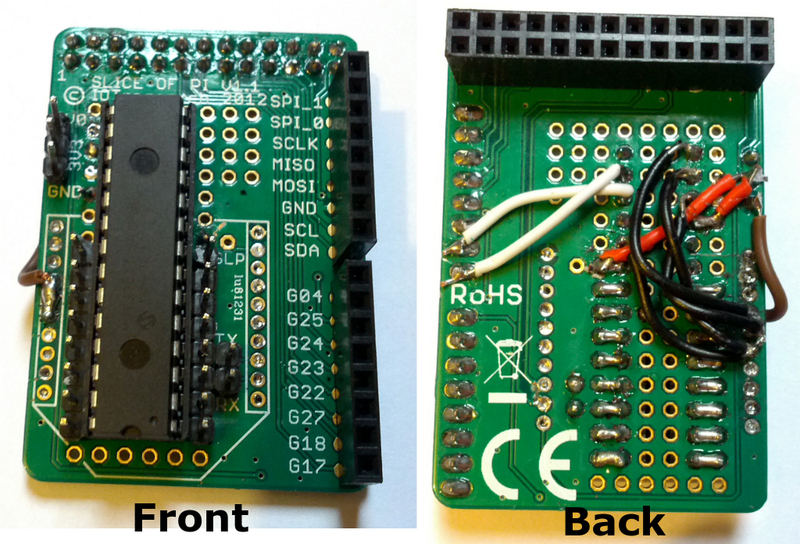 The chip itself can be operated from Raspberry Pi using the i2c port - only two pins (plus power) used. This is just a testing application. On my github you can find the full code. I'm working on a prettier and more elaborate, heimcontrol.js inspired node.js web application that would implement the MCP23017 controls. And here is a schematic: MCP23017 schematic. I didn't really want a breadboard lying somewhere, and breadboard isn't a good idea for a long-term project, so I've decided to solder the chip into a Slice of Pi I've bought some time ago and used for testing (there is a version designed especially for the MCP23017 chip, but I don't have it in hand, so I had to improvise). For now, I've got only two sockets connected, one to a night lamp, and the other one to my Yamaha AV Receiver. I've decided to make my Raspberry Pi switch the receiver on/off for one practical reason. I'm using the Google Calendar API alarm clock, and I just didn't want the receiver to be working whole night. Instead, I've created two simple scripts (or command lines) that I've put into crontab. Now, the Raspberry Pi switches the receiver just before the alarm clock goes off, and back off half an hour later. This saves me energy and keeps my mind calm, as I don't have to be worried about any unfortunate power failures and short circuits. For now, the application has no hands and legs, is ugly and I have to click a lot to switch anything on/off. As I've mentioned, I'm working on a pretty and responsive web application crafted using node.js. To be honest, I've fallen in love with Node, it's simplicity and versatility, and that's the main reason I've chosen it as a programming environment.